In the quest to improve patient care, healthcare organizations are rethinking their approach to IT, and the result has been a slow shift in how these facilities manage their overall infrastructure. With the emergence of electronic medical records, the cloud and the Internet of Things, many companies are moving beyond a traditional, centralized IT strategy and deploying hybrid IT solutions to drive faster services and streamline access to critical data. With this decentralized approach, rather than using a traditional large data center to house all IT infrastructure, health organizations are leveraging “edge” data centers and network closets to place applications in closer proximity to end-users. This makes real-time data access a true possibility, and the framework is changing industries beyond healthcare. Gartner predicts that by 2025, 80 percent of enterprises will have shut down their traditional data center – versus 10 percent that have already done so. Healthcare organizations are benefitting from the movement towards decentralized IT, but there are challenges to be aware of, particularly regarding network management and disaster preparedness. In this article, we’ll explore strategies that facilities can employ to improve critical data protection as they shift toward hybrid cloud models in a way that results in better patient care and bottom-line benefits. Hybrid IT models allow healthcare organizations to shift critical infrastructure to a mix of on-premise, cloud and edge environments. This can give IT managers better control over their operations while improving the patient experience through faster access to electronic medical record data, enhanced connectivity and greater reliability of critical services. But like many IT paradigm shifts, this one comes with a catch. As the demand increases for more data and faster services, so does the pressure to effectively protect these systems. Without a strategy in place to protect each dimension of a hybrid IT environment, data can be susceptible to outages and, in a worst-case scenario, loss. With IT assets spread across on-premise and cloud systems, ensuring uptime within this type of distributed infrastructure can be challenging. A recent Uptime Institute report showed that power outages are becoming more common in data centers as organizations struggle to adjust to the complexities of hybrid IT. Though an average data center is making better use of its energy today, it is more likely to suffer an outage more damaging than the previous year. 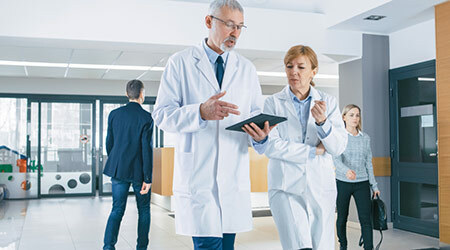 As healthcare organizations look to capitalize on the benefits of hybrid IT models, they must have the right tools to help effectively manage their network and avoid unplanned downtime. Since hybrid IT infrastructure relies on the interworking of systems – some of which don’t have on-premise staff on hand to help monitor and manage – organizations must take a strategic approach to power management and disaster preparedness. Components at the hardware level offer a good starting point in the evaluation process, but IT staff must also contemplate virtualization and network-as-a-service infrastructure to ensure they’re prepared for potential outages. An integrated power management system includes the range of devices needed to safeguard systems, from central IT functions to the proliferation of edge data center endpoints. This should include a mix of rack enclosures, power distribution units (PDUs), rackmount and end-of-row uninterruptible power systems (UPSs), and power management software and services. Together, these solutions can help organizations protect and manage their investments in a broad range of IT environments from multiple providers. By combining power automation and management solutions with common management platforms for virtualization or orchestration like those from VMware, Cisco, NetApp, Dell EMC, HPE, Nutanix and Scale Computing, organizations can extend the availability of IT services. With a solution that aligns power management and virtualization software, technicians can manage physical and virtual servers, and power management devices all from a single console. As software takes on an even more important role in our increasingly digitized world, solutions will continue to advance in the integration of hybrid IT to enable seamless migration of IT resources between on-premise and the cloud. As technology continues to advance, the capabilities for healthcare organizations to improve patient services and streamline operations within their facilities will only grow. This potential will come with even greater demands on the underlining power infrastructure. Because everything a healthcare facility does is mission critical, unplanned outages can have a devastating impact on their ability to offer quality care to patients. In deploying a decentralized IT network, you’re only as strong as your weakest link. It takes strategic thinking and investment to ensure uptime within this infrastructure, but it’s one where the risk is often worth the reward. With a strategic, integrated power management system in place, healthcare organizations will have the peace of mind that comes from knowing patient data is protected and can be used to reliably improve care. Hervé Tardy is Vice President and General Manager of Eaton’s Distributed Power Infrastructure business unit.